Though it can feel a little top heavy at slow speeds – inevitable with a bike that carries its weight high up – the Aprilia Futura handles in a similar manner to any other Aprilia Vee twin – well. The bike is stable at almost any speed, and the factory panniers don’t affect the way it handles so long as you don’t overload them. While it doesn’t have the slow speed poise of a BMW flat twin, the weight seems to fall off as you get under way. 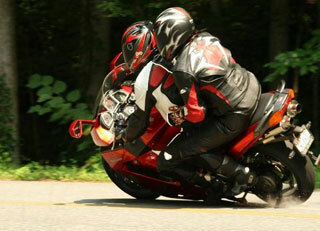 But it can be a handful – especially for shorter riders – when doing slow speed manouvres. It does, however catch sidewinds badly, because the wind has nowhere to go against that slab-sided fairing. Buffeting from sidewinds can be quite violent, especially at high speed, so be ready for it. A Futura with well set-up suspension will corner as well two-up as it will solo, though the stock shock can protest a bit when fully loaded. 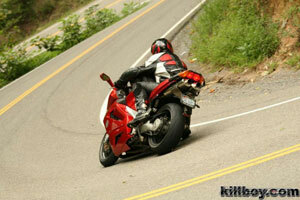 Larger riders who tend to travel two up a lot would do well to consider an aftermarket shock. The original shock doesn’t seem to have enough preload to cope. The first thing to touch down on an Aprilia RST1000 Futura is the centre stand, which can be a particular problem when carrying a passenger – even with rear preload set to maximum. If yours touches down easily then bump up the preload and this usually cures the problem. Otherwise check the rear shock page for upgrade options. This isn’t too much of a problem as there is a certain amount of give in the rubber bump stop. Next to touch down is the side stand, which can be a good deal more alarming. Fitting an aftermarket pre-silencer such as the AF1 H-pipe can make a big difference. The pipe has a slot for a bump stop but if you fit the one from the original pre-silencer you may find ground clearance seriously reduced. 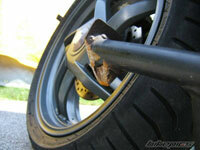 You can cut it down or remove it altogether to regain maximum clearance. Thanks to Apriliaforum member Meanstrk for the photos and the demonstration of what an Aprilia Futura can do in the right hands. There’s more from him in the video section.